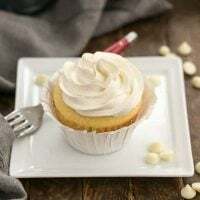 Dreamy cupcakes for white chocolate lovers! Preheat oven to 350º. Line muffin tins with paper liners. In large bowl, beat the butter and sugar on medium speed till light. Add eggs, one at a time, scraping bowl between additions. Mix together milk, lemon and vanilla. Add half this mixture to the batter. Mix until just blended, scraping down sides of bowl if necessary. Add half the dry ingredients and mix in well, followed by the remaining milk mixture, then the rest of the flour. Scrape down sides of bowl between additions. Divide batter into 14 or so spots in the muffin tins. Bake in the middle of the oven about 15 minutes (mine took 23 minutes) or till tester inserted in the middle of the cupcakes comes out clean. Cool for 10 minutes then remove to rack to finish cooling. Melt the white chocolate in a microwave safe bowl, gently in the microwave…use 15-30 second intervals, stirring till melted. Cool to room temperature. Use mixer on high to whip the eggs till thick and cooled to room temperature, about 5 minutes. Turn mixer speed to medium and add butter by tablespoon, making sure butter is mixed in before adding the next tablespoon. Add the chocolate and vanilla and mix till smooth. If the icing is too runny, refrigerate briefly till it thickens. Ice the cup cakes with the frosting and sprinkle with white chocolate chips. I did not use all the frosting, so actual calories may be less.